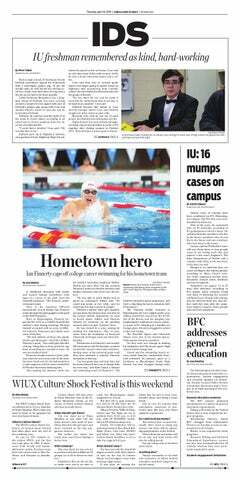 Following the Indiana Daily Student breaking accusations of sexual harassment against county commissioner Amanda Barge last week, uncertainties about Bloomington’s mayoral election and more have arisen. In Nile Arena’s opinion, an election isn’t an election without a little competition. Jim Blickensdorf, who was running as a District 3 Bloomington city council candidate, dropped out of the race Wednesday afternoon, according to a statement on his campaign website. Amanda Barge suspended her campaign for Bloomington mayor Tuesday, less than a day after the Indiana Daily Student published an article outlining sexual harassment allegations against her. Five of six candidates running for three seats in the Bloomington City Council at-large Democratic primary spoke Monday night at a Democracy For Monroe County forum. Ron Smith, 64, has spent most of his life as an advocate for children, the disabled and the elderly, working in various state government departments. Now, he wants to take this experience and serve his community. IU issued a response Thursday to President Trump’s executive order promoting free speech on college campuses. Democratic mayoral candidates Amanda Barge and John Hamilton faced a full auditorium Monday night at the Monroe County Public Library to answer questions on a variety of topics. Sue Sgambelluri, 53, is one of four candidates running for Bloomington City Council’s District 2 seat in the 2019 primaries, the only seat with both Democratic and Republican candidates. Former Sen. Birch Bayh, an IU alumnus who authored two constitutional amendments and Title IX, died Thursday. He was 91. After three years in office, Hamilton is running again. Here’s what he’s done so far. When Mayor John Hamilton was sworn into office in 2016, he pledged to work for wage growth, affordable housing, the betterment of public education, government efficiency, more transparency and more engagement. President Trump announced Saturday he will sign an executive order to ensure colleges and universities support free speech and will deny them federal research funds if they do not. INDIANAPOLIS — Students crowded near a microphone at the top of a side staircase at the Indiana Statehouse for the 2019 Indianapolis March For Our Lives rally to make sure news cameras saw their messages. Mayor John Hamilton and mayoral candidate Amanda Barge debated affordable housing Tuesday night in an unusual location: a classroom. State lawmakers are attempting to ban dilation and evacuation, a common abortion procedure performed in the second trimester. The bill criminalizing it moved from the Indiana House of Representatives to the Senate on Feb. 22. Democratic mayoral candidate Amanda Barge responded Friday morning to Mayor John Hamilton’s State of the City address Thursday night in a speech for press. An Indiana Senate hatecrimes bill was stripped of protected groups Tuesday. A bill justifying the use of force in certain instances of self-defense passed the Indiana House of Representatives Feb. 12 and has advanced into the Senate.